Charles Darwin University and Universitas Nusa Cendana (UNDANA) have hosted an international conference in Kupang on Geographic Information Systems (GIS) applications. 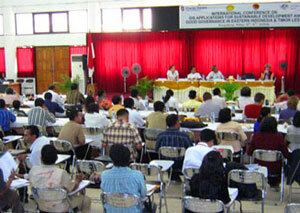 The conference, GIS Applications for Sustainable Development and Good Governance in Eastern Indonesia and Timor Leste, attracted more than 150 local and international participants. Senior Research Fellow with CDU’s School of Environmental and Life Sciences, Dr Bronwyn Myers said the conference had grown from the remote sensing and GIS activities of CDU research associate Rohan Fisher. “The conference was originally planned as a forum to review GIS applications in the eastern Indonesian province of Nusa Tenggara Timur, but so great was the level of interest that it evolved into an international conference,” Dr Myers said. In total, 17 presentations where delivered over two days by leading experts from Europe, the United States, Australia and Indonesia as well as local practitioners from Nusa Tenggara Timor and Timor Leste. Topics covered included forest monitoring, catchment modelling, community development, public participation GIS, disease mapping and health infrastructure assessment, data standards and sharing, and GIS community building. Participants came from a wide variety of government, academic and NGO sectors. This conference was just the latest step in building closer links between UNDANA and CDU in remote sensing and GIS for sustainable livelihoods. CDU also has acknowledged the value of sharing the experiences of using such technology in a less industrialised context to a broader international community and will publish the conference proceedings as a book in English and Indonesian later this year. For more information contact Rohan at rohan.fisher@cdu.edu.au or visit the website indonnrmpslp.ehs.cdu.edu.au/conference.